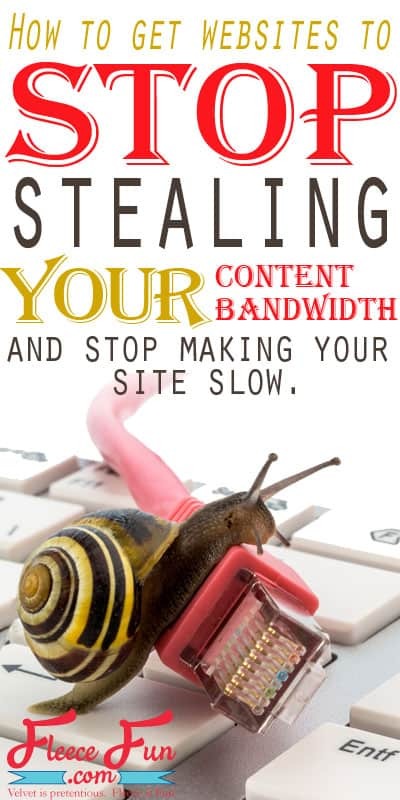 Blogging tips: How to keep people from stealing your bandwidth and content. It’s one of the biggest issues with DIY bloggers: stealing content. As I’ve stumbled around in the blogosphere I’ve figured out a few interesting things about protecting content, and bandwidth. Whether it’s in the form of a tutorial that’s just a little too close to yours or a site that blatantly scrapes your content, here are a few ways you can protect yourself and your blog. Read below for some tips and tricks on protecting your site and content. Know and use the blocking codes. Thanks to some really dumb and short sighted legal ruling YEARS ago it’s the liability of the website owner to prevent new technologies from scrapping their site. Which means that whatever new social media scrapping site springs up ( IE Pinterest or Spark) it’s on you to prevent scraping (gathering data). I personally have several blocking codes on my site. You read about my logic in using the no pin code in this article here. For the record I love Pinterest – it’s my #2 traffic source. However I also like to control how my images are shared. Ehow’s Spark not only scraps images but text as well – no bueno. While other scrapping sites might not be as severe as Ehow I tend to block them as well. Why? I don’t have time to monitor and be active on them. I’m active on Pinterest and that’s it. (Oh and you can follow me on Pinterest here). While some might argue that it’s not good business to have these blocking codes, I think I have a pretty compelling argument here (at least it’s food for thought). Prevent hotlinking to your images and files. Until I had this one figured out it drove me CRAZY. 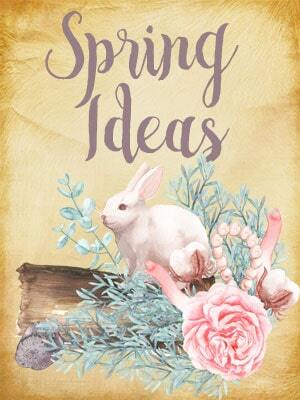 I share a lot of free sewing patterns and printables. I love bringing these resources to my readers. But I H-A-T-E it when a site hotlinks right to my pdf file by passing my webpages completely stealing my content since no ad revenue is made. There are some automated sites that all they do is send crawlers over the web to scrape pdf file links. 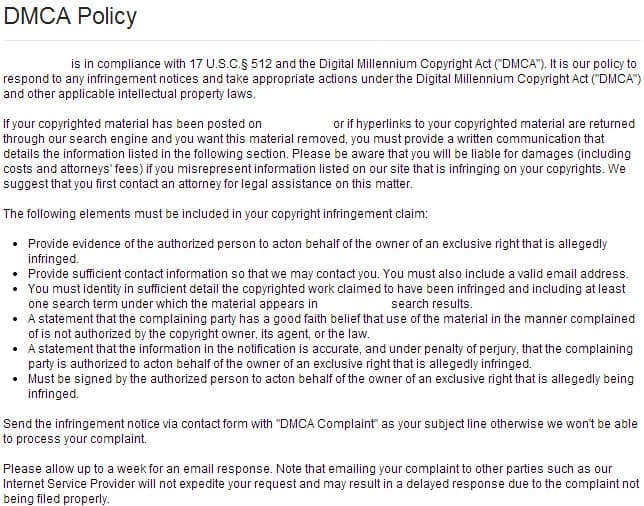 And they have the most ridiculous terms of service. Here’s an example (and these guys are so slimey it’s in image form not text. Heaven forbid you scrape their text. ): How nice, you’ve scraped my content and you’ll get back to me in a week – and if I report you for being the scum you are, you’ll take even longer to remove MY intellectual property from your site. Jerks. Then there are the people who hotlink to your photos because they’re too lazy to save and upload them. Between the pdf file hot links and the image hotlinks your website’s speed can be seriously affected. Even if you’ve done everything right! Well here’s how you get the final laugh on these sites and it took me a while to figure it out. You can prevent people from hot-linking to your files, and images. There are multiple ways to do this. 1. Use Cloudflare. They have a free service and one of the things they do is prevent hotlinking to your images. No more people stealing your bandwidth and it will increase site speed. 2. Prevent hotlinking to any file type you want, and redirect it also. I have yet to find a good plugin for this, but many hosts will offer a solution. My host, Blue Host offers a tutorial on how to do it through their set up here. What I love about this is that I have the option of adding other file extensions ( like pdf) to the “No hotlinks allowed” list. and I have it redirect to my pattern page. So if someone does try to hotlink to a pdf pattern the user gets sent to my pattern index and can find what they need – just on MY site. 3. Access your .htaccess file and perform brain surgery on your site. I have to be honest this is where code goes over my head. If you’re not fluent in code I wouldn’t attempt it. But if you are or know someone who is there is a tutorial here on how to do it. It’s important to have clear “rules” for people to follow. It’s also important to have them up in plain view so when someone does break them you can point to them and say “It says that’s a no no right here”. The simpler and plainer the language the better. 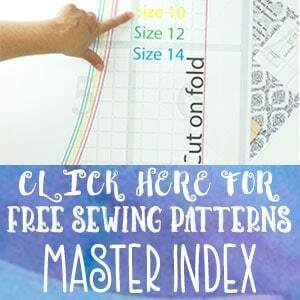 I’ve had a couple of occasions where people thought it was OK to do a complete tutorial on one of my patterns or printables following the exact same steps as me and link to my page. Uh, no sweetie, you didn’t come up with the pattern, idea or steps and the fact that you used a different type of glue does not make it OK. You want to show off your final product and link to me – I think that’s awesome. I’ll pin to my “Everyone is Having Fleece Fun Board” and comment on your blog. But redoing my tutorial is not cool… ok soap box is finished…ish. The truth is every time that’s happened to me it’s been a newbie blogger who just needed a little guidance on what’s acceptable and what’s not. And I’m happy to say that every one of them were great, they revamped their post and I was happy to show them some social love as a “thank you” for being a good sport. But then there are the sites that are scum, evil, and deserve a special hell. I’m talking about the sites that scrape everything. They take your pictures, text, and files. They think that giving you credit and a link back is good enough and somehow absolves them any wrong doing. Hey, whatever makes it so you can sleep at night, but it doesn’t change what you are when you wake up in the morning. I’ve had a couple of run ins with these sites. Usually I was blissfully unaware of my stolen property until another blogger told me about it. 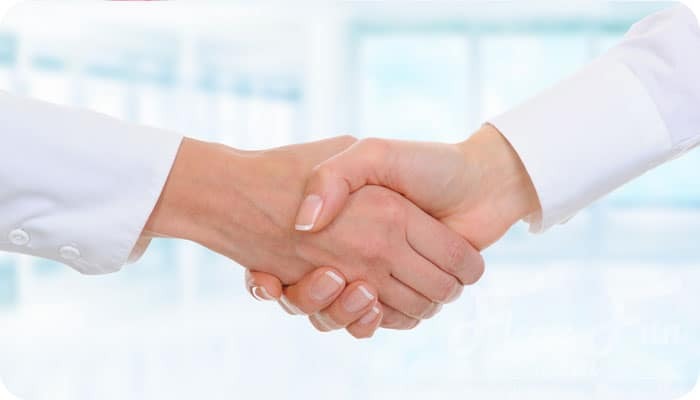 If you can track down a contact and email them – they will usually take it down. However sometimes it’s near impossible to find one. That’s when you have to contact the whoever is hosting the site and report them. Also if you’re surfing the web and see a tutorial on a site that looks like it was stolen, pay it forward and tell that blogger. We need to have each other’s backs on this, because who has time to constantly research past content to see if it’s been stolen? Funny story – while I was doing some research for this article I found this tutorial of mine that had been stolen. Don’t worry that’s a no follow link. These guys even added their watermark to MY photos! @&#$!!! Grrr, special hell. If spoke Russian I would give them a piece of my mind. You can see MY tutorial for that here. Which reminds me watermark ALL of your photos. This is one of my first tutorials and I didn’t watermark the pictures. It makes it easier for people to report your stolen content. The truth is if you produce good content people will want to steal it. The secret is is to continue to produce more good content. I remember a saying “Don’t pull weeds plant more flowers”. The same is true with blogging. One or two posts might be swiped, but if you keep producing amazing content your blog will come up first in the SEO ranking every time. And those scummy sites will always come up last. Я – автор сайта, на котором разместили Вашу статью. Я категорически не разрешаю печатать статьи без разрешения автора мастер-класса. Но за всеми не уследишь. Без всякого сожаления удаляю Ваш мастер-класс со своего сайта, и делаю строгое и последнее замечание тому, кто его разместил. Thank you for removing the plagiarized post. I appreciate you taking action and keeping very high standards. 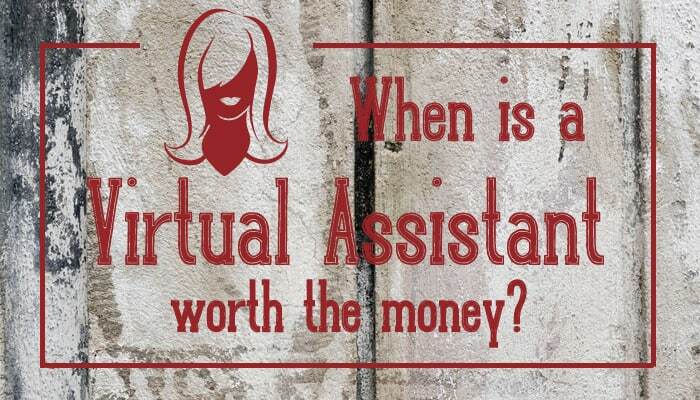 When is a Virtual Assistant Worth the Money?